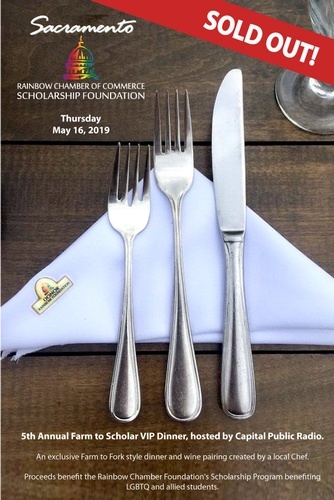 Please join the Rainbow Chamber Foundation for our 5th Annual Farm to Scholar VIP Dinner, hosted by Capital Public Radio. Enjoy an exclusive Farm to Fork style dinner and wine pairing more details on local Chef to follow. Proceeds benefit the Rainbow Chamber Foundation's Scholarship Program benefiting LGBTQ and allied students. Special Thanks to our sponsor, Outword Media Marketing Events!